blackbirdfashion on Etsy has given me a decidedly large push in this direction. 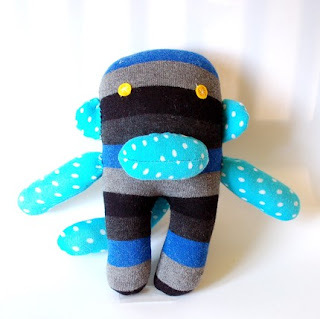 Just take a look at her beautiful sock monkeys and 'socktopi' [yes, she makes something called a Socktopus!]. 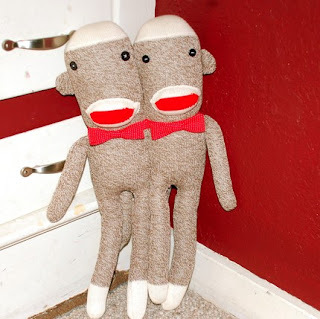 All of these little monkeys are giving me incredible inspirations- they are all so cute, especially these Siamese twins, 'Julius' and 'Edsel'! She has some 'baby' monkeys that are smaller and are actually made from sweaters and sport a pattered 'fur' like this striped cutie below. I will keep you updated on the theme that is ultimately chosen for Jackson's First Birthday, but this is a clear frontrunner to me. 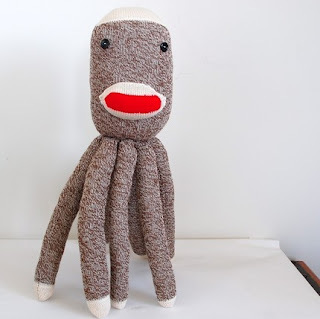 Do you like Sock Monkeys? What theme do you think should be used for Jackson's party?